Updated June 27: Republican candidates Mick Cornett and Kevin Stitt will go head-to-head in a runoff election in August, after they won 29 and 24 percent of the vote, respectively, in Tuesday’s crowded and contentious primary. Democratic candidate Drew Edmondson won his party line and will face either Cornett or Stitt in November. 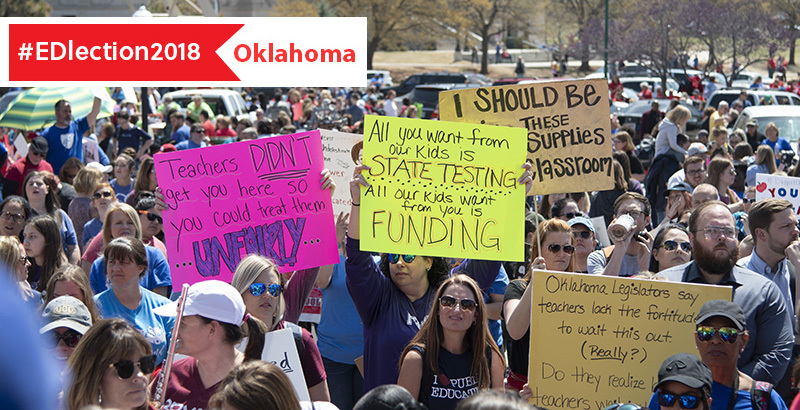 Oklahoma’s nine-day teacher walkout in April — part of a national movement of teacher strikes — has made for a tense political landscape this year. The protest finally ended when lawmakers in the red state signed off on legislation to increase taxes for school funding and teacher pay. This drew fury from both sides. Teachers continued their strike, saying the funds were too little, while conservatives said lawmakers who increased taxes should be booted out of office. Recently voted one of the world’s 50 greatest leaders by Fortune magazine for his work creating temporary taxes to fund projects in a conservative city, Cornett is also well known for bringing the NBA to Oklahoma City during his time as mayor.